A detailed examination of data from an Ethiopian Airlines Boeing 737 MAX that crashed last month has reinforced suggestions an angle-of-attack vane was ripped off seconds after take-off. A recent Aviation Week report bolstering the theory comes as doubts continue about whether the pilots of the doomed aircraft followed all of the necessary procedures as they battled to control the plane. This is despite claims by the Ethiopians that the crew followed all steps recommended by manufacturer Boeing. Aviation Week reported that sources close to the investigation say the flight data recorder supports the supposition that the aircraft’s left angle-of-attack sensor vane detached seconds after take-off, possibly due to a bird strike. READ: Major regulators join international panel reviewing the 737 MAX. Veteran aviation reporter Guy Norris said a detailed analysis of the flight data recorder trace data showed that a divergence in the angle-of-attack data from the plane’s two sensors happened about six seconds after lift-off. The damage triggered a stick-shaker stall warning on the captain’s side. “Almost simultaneously, data shows the AOA sensor vane pivoted to an extreme nose-high position,’’ Norris said in his report. “The vane is counter-balanced by a weight located inside the AOA sensor mounting unit, and without aerodynamic forces acting on the vane, the counterweight drops down. The faulty AoA reading activated the aircraft’s controversial maneuvering characteristics augmentation system (MCAS), which pushed down the nose. The crew moved to counteract this using electric trim switches on the control column but Norris noted they only applied about 20 percent of the nose-up movement needed to correctly re-trim the aircraft. MCAS, not sensing any to return to an appropriate AoA, activated again and the crew fully offset the mis-trim from that activation. But Norris said some 80 percent of the initial MCAS-supplied nose-down trim was still in place when the crew activated the stabilizer trim cut-off as part of the Boeing procedures to disable MCAS. Attempts to use the manual trim wheels were unsuccessful and stabilizer trim cut-out switches were then turned back on, reactivating MCAS and resulting in it pushing down the aircraft’s nose for the third time. Sources told Norris that the residual forces in the mis-trim would have been locked into the control system when the stabilizer trim cut-off switches were thrown. “This would have resulted in forces on the control column of about 50lb when the system was switched back on,” he said. “Although this could have been reduced by manually trimming the aircraft, this did not occur, and the third MCAS activation placed the aircraft in a steep nose-down attitude. Norris said the source suggested the crew appeared to be overwhelmed and, in a high workload environment, may not have followed the recommended procedures for re-trimming the plane. He pointed to the second step in the checklist which directs pilots to control aircraft pitch manually with the control column “as needed”. A number of pilots and other experts have also questioned why the aircraft remained at take-off thrust during the entire incident and was traveling at high speed. The preliminary accident report showed the plane exceeded the maximum speed recommended by the manufacturer, resulting in an overspeed warning and making the horizontal stabilizers more difficult to move. A pilot who has flown a MAX for a US carrier, Robert Graves, told The Wall Street Journal recently that the high speed was tantamount to a driver experiencing a sudden blowout on a highway and not lifting their foot off the accelerator. Boeing has been working on changes to MCAS it says will prevent a repeat of the Ethiopian crash and a tragedy last year involving Indonesia’s Lion Air. 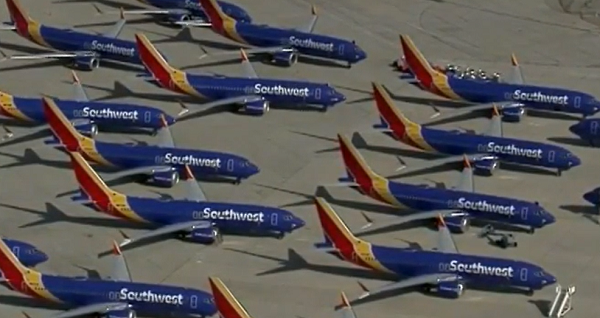 The crashes prompted the global Boeing 737 MAX fleet to be grounded and there as yet no indication of when the planes will return to service. However, chief executive Dennis Muilenburg said on Thursday the company had made 96 test flights totaling 159 hours with the updated software. Muilenburg told a leadership forum in Dallas that about two-thirds of MAX customers had tested the new software in simulators and more were expected to do so in coming weeks. US media are reporting the company will submit its plan to fix the MAX to the Federal Aviation Administration and other regulators within the next two weeks. Boeing, the maker of the 737 Max 8 aircraft, is accused of rushing the plane to market without enough testing or training for pilots. The US Government says Boeing "...engaged in concerted actions to conceal, deny, and downplay the hazards and safety concerns, in violation of federal regulations, presented by the Boeing 737 MAX 8’s new features." Your quote is not from a government finding but appears to be wording used in civil lawsuits seeking compensation from Boeing. These lawsuits, often conducted on a "no win, no fee" basis, are common after a crash, particularly in the US. I suspect we won't see results from the government-initiated inquiries for a while yet. Also, Brett, may I add that the accusation that Boeing rushed this design was made by the lay media. The reality is that the design and construction of the MAX was, in fact, the slowest of any of the three major 737 upgrades at 4.5 years from launch. It was almost a year in development before that. It is to be regretted that lay media do not check the facts. Very easy to do. Also, some have said that it is a 1960s design with computer upgrades. Exactly the same can be said of the 747. Regards, Geoffrey Thomas, Editor-in-Chief.